Hi guys! Summer has taken up residence in South Carolina, and I'm not too happy about it. I'm more more of a Fall weather girl! The highs this week are going to be 99... all week. I am going to melt! I just hope this is just an anomaly, and not an indication of how warm July/August are going to be! For June, the Hobby Polish Bloggers selected the theme of beach nails. Each blogger can interpret the theme however they choose - whether it is nail art or simply a beachy polish. My nail art skills are no where near as awesome as some of the ladies in the group, but I do like trying, and I use these link-ups to challenge myself to be a little more outside my comfort zone. Plus, I can't get better if I don't try! I wanted to be a little different and instead of doing a beach scene, I deconstructed the look a bit, and made each nail a separate part of the scene. 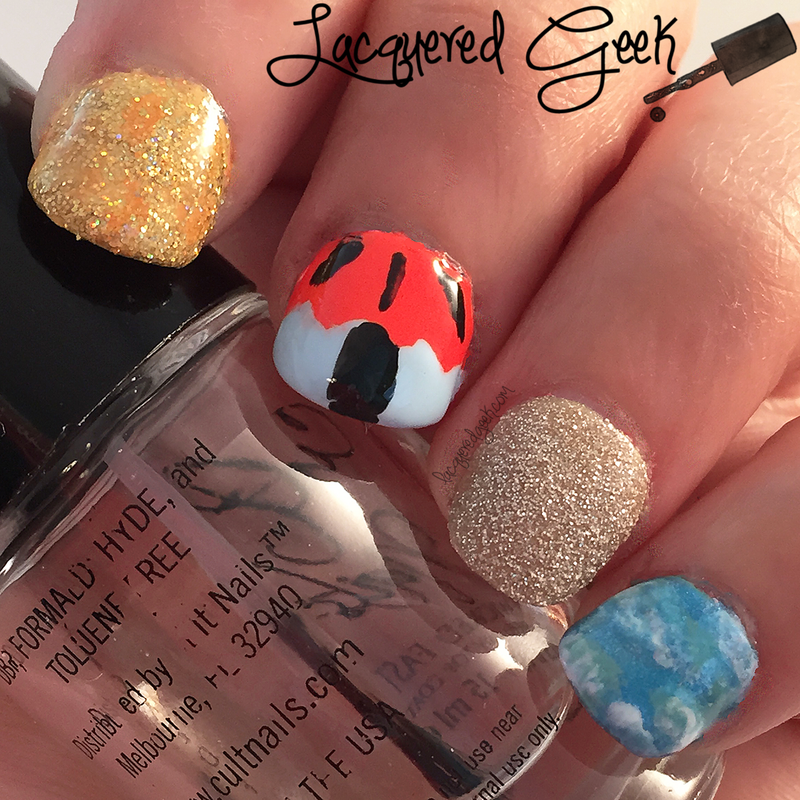 I used an eye shadow applicator to sponge the colors for my sun and ocean nails. Even though Godiva is a textured polish, it didn't look enough like sand, so I used the applicator to rough it up a little. Overall, I like how the look came out. My husband couldn't figure out what it was supposed to be. He thought my umbrella nail was a gum line and teeth. I'm not sure who he knows with blue teeth! I really loved my ocean surf nail, but for all the wrong reasons. Zoya Wednesday was a bit too green, so it ended up looking more like the Earth from space, or at least to me it did. Hello Earth Day nail! So I'd love to hear your thoughts on my take on beach nails? Do you have any plans to hit the beach this summer? Be sure to check out the other talented ladies who have taken part in this month's link-up! I agree it looks a bit Earthy, but beautiful nonetheless! I like the ring finger a lot! It looks just like sand. 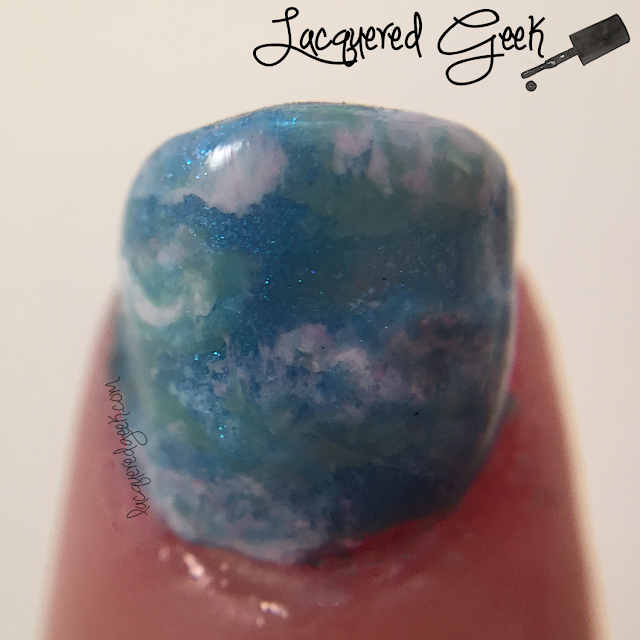 I lol'd at Hello Earth Day nail! Haha I dunno I thought it looked like a murky sea! Love your deconstructed idea! I love the pinky! I'm already over summer. It hasn't hit 99 here yet, 92 has been the highest so far. I love how you did something different for each one. My favorite though has to be the pinky - even if it's a little earthy lol. I like the deconstructed look. My favorite would be, like you, your pinky. The extra little sparkle just caught my eye. That must be the Revlon Surf Spray? And when I checked the entries this time, that bright beach umbrella really took center center stage, and said click me!